I first heard the Mary Oliver poem, The Summer Day, in high school. The last line "What is it you plan to do with your one wild & precious life?" was a regular challenge to my classmates and me from my senior english teacher. It was a question that stirred my soul. In the years since high school, this poetic line has gained meaning as it has been shaped by my understanding of the gospel. If you have read C.S. Lewis' The Lion the Witch & the Wardrobe (or seen the movie), you'll remember the line "He's not a tame lion." This line refers to Aslan, the character Lewis uses to represent Jesus in the fantasy world of Narnia. The way God pursues us is the most precious gift I could receive, and the choice to follow him is a wild one. The more I mature in my faith the more I realize how big He is and how not in control I am. Following Jesus does not promise that life will always be easy. Hard times do and will come. Just with an untamed lion, you can't always predict what is next. But when I think back to the valleys of my life I can see how tenderly God held me and pulled me through. Some of the most precious times of my faith journey come from when God walked beside me through those times - displaying his great love for me. And not only does He pursue and guide us through the valleys, but he delights to guide us to the mountain tops where we can experience His glory. He cries with us and He laughs with us - an ever present God. God's love for us is anything but tame. His desire for our hearts is ferocious and wild, but oh! is it precious -- so very very precious. So true and perfectly said. I have always loved your blog title and I love how it applies to the most important part of your life. I think you got your words perfectly right. For me, there's nothing like looking back, even in the hard times and seeing how much God carried me. I don't think I could get through anything without Him. beautiful post! God uses such cool ways to get to each of our hearts specifically; how neat that He used a poem to speak so deeply to yours! 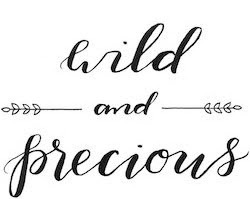 I've always wondered where you came up with wild AND precious for your blog title. Thanks for sharing. A song to check out... Aslan by Kendall Payne! Reminds me of this post! well said. loved this post. Yay for Mrs. Freeman's class!! Love this post - beautiful. You know what, I always wondered where you got the lovely name for you blog, so, this was such a fun and informative post...thank you! Hope you and your beautiful family are well and enjoying the start to the week so far!